This "Birds At Large" series exists because I enjoy the confusion that exists at the intersection of the birding and non-birding worlds. I like seeing how they view us. And how is that? 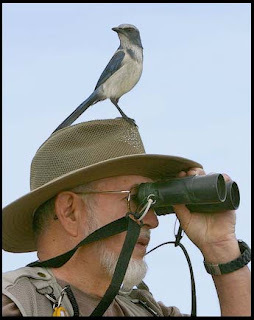 Apparently, it's as people who look through binoculars while birds sit on our heads. 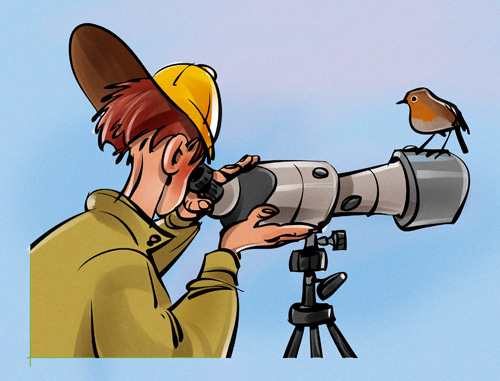 These are among the first page or two of images for a Google search of "Birdwatcher" and "Birdwatching." OK OK I get it! Does this trend say anything about how the rest of the world views us? I'm not so sure. On the one hand, it could be seen as a statement that birders are aloof and complacent and contemplative and unconcerned. It's just as likely, though, that it birding simply poses a difficult visualization challenge for artists. All the same, I'd like to make a challenge to book publishers, clip art artists, movie promoters: make a birding image that doesn't involve a bird sitting on a birder's head. There are more interesting and creative ways to illustrate us! The king parrot image is mine (http://www.flickr.com/photos/lookfar/2162977266/) and that is just the way it happened - no photoshopping involved at all. Despite it being all rights reserved a lot of people have used it without my permission on the internet for all sorts of things - including you actually. David would you like me to remove your photo?